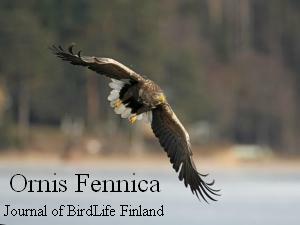 Ornis Fennica is a peer-reviewed international ornithological journal published by BirdLife Finland. Ornis Fennica publishes analytical and experimental papers on the ecology, behaviour and biogeography of birds. Ornis Fennica prefers studies concerning Fennoscandian species, but other novel contributions of general interest are most welcome as well. 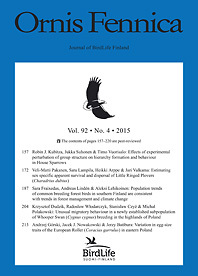 Ornis Fennica is an open-access journal without page charges for publication. All published articles (from 1924 onwards) are freely available from the journal website. First decisions are usually made within three months of submission. Our peer-review process follows the principles outlined by the Federation of Finnish Learned Societies. From No. 4/2015 onwards, all peer-reviewed publications in the journal are marked with a peer-review label (https://www.tsv.fi/en/services/label-for-peer-reviewed-scholarly-publications). BirdLife Finland and Ornis Fennica acknowledge Selengemurun Dembereldagva for scanning and digitalizing all Ornis Fennica issues published prior to 2005, and the Otto A. Malm Foundation for financially supporting the scanning process.